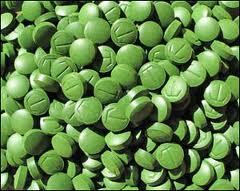 Chlorella, also known as “sun chlorella” is a simple algae that offers a complex variety of benefits. The Japanese have been hip to chlorella for years, but it’s only caught on in the Western markets more recently. Chlorella is an excellent source of Vitamin B-12 (usually only found in proteins), B-1 and B-2, folic acid, and Vitamins C and K.
It is interesting to note that the chlorella molecules only bind to toxic metals and not to the minerals that are good for humans. Now, because of its powerful detoxification abilities and immune enhancing components, it is thought that regular use of chlorella may reduce the risk of all types of cancer.